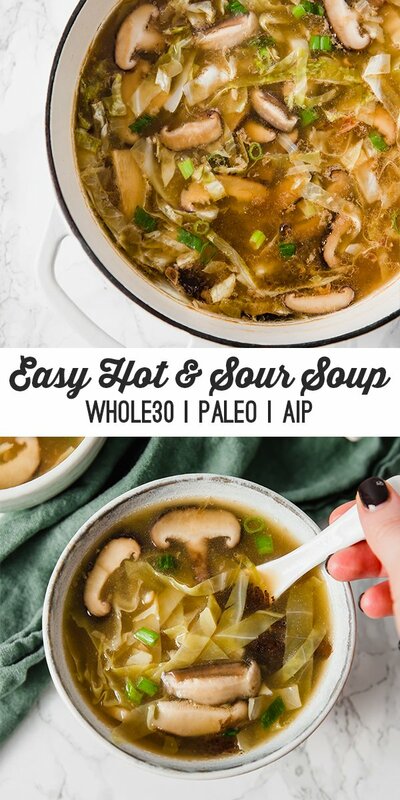 This hot & sour soup is an easy and nourishing dish! It’s paleo, whole30, AIP, and an all around healthy and filling meal. I’ve shared my families love for Chinese food here on the blog before, and I’m back to share another adapted classic! 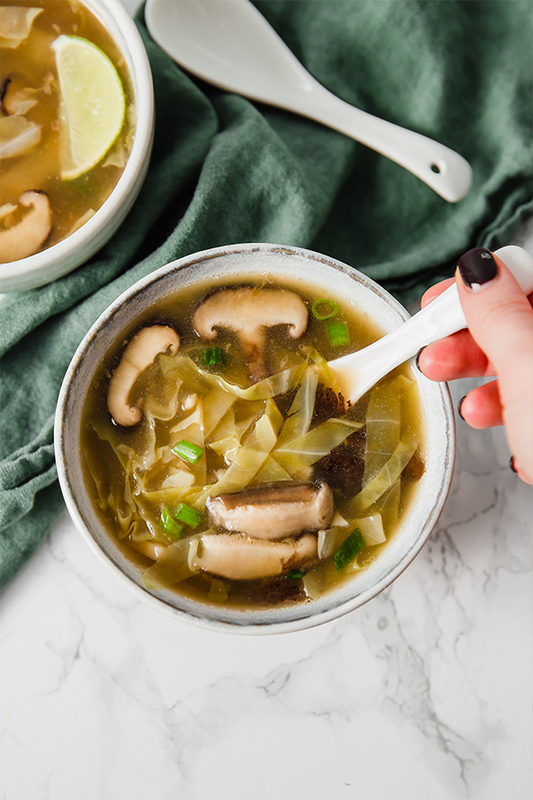 My brother loved egg rolls (so I made my Egg Roll and a Bowl and Egg Roll Soup) as well as beef and broccoli, and Hot & Sour soup was always my mom’s favorite, so I decided it was time to make an easy, paleo version. I was an extremely picky eater as a kid, so I don’t think I ever even tried hot & sour soup until I was older, but I remember the intoxicating smell, and how it felt warm in my hands when I was carrying it in from the car during the winter if we were getting takeout. This soup tastes just as good as it smells, and it’s every bit as warming as I remember it. The thing is that your average hot and sour soup isn’t super nourishing. It’s made with cornstarch, soy, and more that just don’t make it as healthful as it could be. This soup is the opposite! It’s made with easy to source and healthy ingredients that are paleo, gluten free, AIP, and whole30. Sign me up, right? … or just keep it vegetarian! Or if you’re looking for something easier to find, white button mushrooms will work! You can use homemade bone broth (even better, actually) but just make sure it’s mildly flavored. 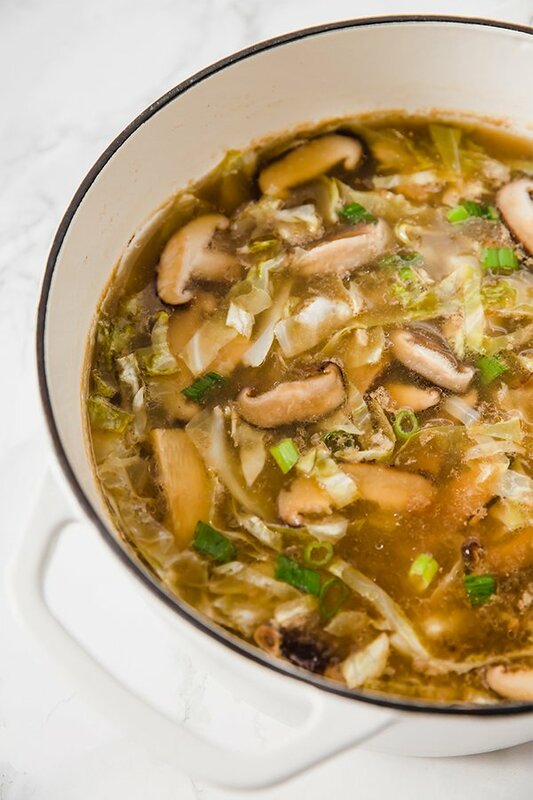 You won’t always find this in hot & sour soup, but it adds more nutrients for not a lot of cost. This replaces what would traditonally be cornstarch in this dish and thickens the soup. You can likely use tapioca starch. These add a lot of heat to the soup. Gotta have that sour flavor! This is the soy sauce substitute that you can buy at most health food stores and online. Using a large stock pot set to medium heat saute the pork until fully cooked. Lightly salt and set aside. Drain the fat from the pan and add the avocado oil. Saute the garlic and ginger for 2-3 minutes or until fragrant. Add the mushrooms and bamboo shoots saute for 4-5 minutes or until tender. Add the shredded cabbage and cook until mostly wilted for about 2 minutes. Pour in the chicken broth (reserving 1/4 cup and setting aside), coconut aminos, salt, lime juice and white pepper (if using). Simmer for about 10 minutes to combine the flavors. While the soup is simmering, combine the 1/4 cup of broth with the arrowroot starch. Whisk together to thicken and add to the soup and stir. Simmer for another 5 minutes to allow the soup to thicken. Add the pork back and simmer on low for another 3-5 minutes to reheat. Finish with lime slices if desired and top with green onion. Season further to taste. Oh Michelle, as I contemplate doing AIP I keep coming back to your recipes because they resonate with my tastebuds and give me hope. Either way this recipe will be delicious no matter what! I have everything in stock already! Thank you. Thank you so so much Sarah!!! Thanks for the great recipe. I did half cabbage half bok choy and added a splash of fish sauce and cilantro after I took it off the heat. Definitely adding an egg with leftovers. It really feels like take-out! Ooooh yum! Love those additions! Thanks for sharing, Nicolette! 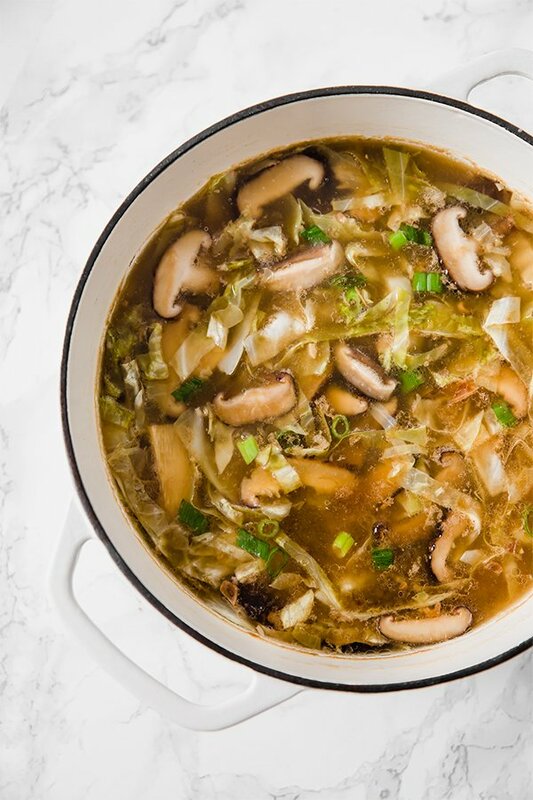 I made the Hot & Sour soup – oh my, it was so good. I haven’t eaten Chinese foods for years, but this really hit the spot. Just made this soup. It is delicious! One of my new favorites. Tasted so good it was hard to stop eating even when I was full. Oops! Thank you so much, Cecilia!! So glad you liked it!! Very good. Added a bit more coconut aminos to salt it a bit more. Thanks so much, Lisa! So glad you liked it! !